One could weigh 6 or 10 tablets at once, perhaps. Yes, that would definitely be possible. Most people I know who use the scale method just used several pills to get their average weight, not the whole bottle like I did. So you could probably just put six pills on the pan and divide by six to get an average weight. Of course I like to make things more difficult than they have to be lol. I guess I figured the more pills you used, the more accurate your average weight would be. You are correct. You could weigh a group of 6 tablets 5 times, to average the weight of 30 tablets. We've discovered an easy method for refilling capsules with one's new, lower amount of beads. 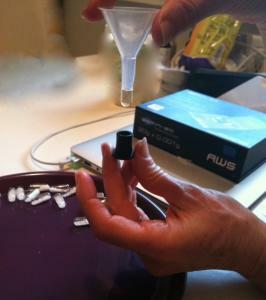 It involves using a specific mini funnel and "00" size empty capsules. You want a funnel with the outside diameter able to fit into the capsule opening. Put the open capsule into your eye-dropper stand. Stick the funnel into the open capsule. Our funnel stays standing there on it's own, right in place while you measure out your beads on the scale. 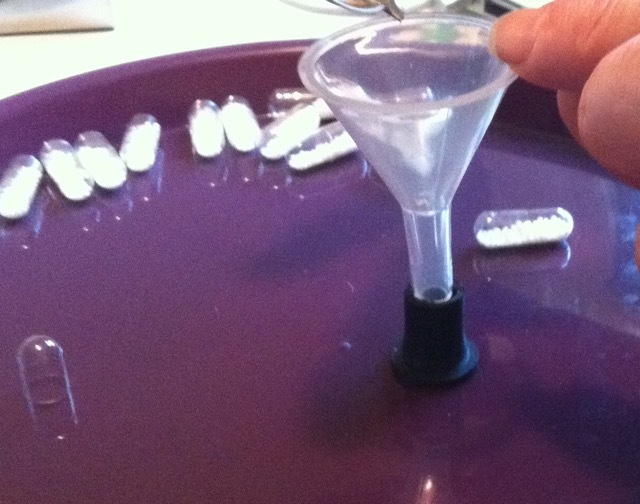 After you measure out the beads, simply pour directly into the funnel. Pull funnel off while you hold the capsule base, and then stick your other capsule end on it. Done! Also, we use a rectangular gem scoop for pouring loose beads onto the scale. This tool makes it much easier to pour out loose beads in small amount because of the 90 degree angle to the scoop edge. You can use the tweezers that come with the Gemini scale to incrementally push beads onto the scale. We use the #2 size scoop. Very creative, using jeweler's tools to handle the beads! No, I don't think the funnel fits into the size "0" caps. The "00" caps have a larger opening than the "0" caps. They are bigger than most capsules, which is good news given the size of the funnel end. Bonus is that your dosage of medicine looks small relative to the size of the capsule, and has the positive psychological impact of affirming the titration process--ie, "wow, look how little I'm taking now!" The problem with this gemini scale is that it keeps reseting if you don't use it straight away. Also, does this funnel work with 000 size capsules? I am counting the beads in my AD, so will this scale method work with weighing beads? I'd think it would, since the capsules get larger with more "0"'s (as I understand it). However, the "00" size snuggly fits the funnel, so the funnel stays standing in place tucked right into the capsule half while you are weighing your next bead amount on the scale. I'd recommend the "00" capsules; you'll be doing the transfer of beads into the capsules for weeks & months, so keeping it easy seems worth it. The ones many of us use are the Gemini-20. They are available on Amazon or Ebay for about $35. The next step up runs in the $150 range and the reviews don't indicate that they are any better. I've been using mine now for almost 4 years without any problems. If you order them be sure to also order a bag of "0" gel caps, they will make it a lot easier to make up your doses. I've been having issues with the Gemini-20. Even in a room with no fan on, no A/C on, no noise, not breathing on it, not leaning on counter.. I can't get an accurate reading from the scale. 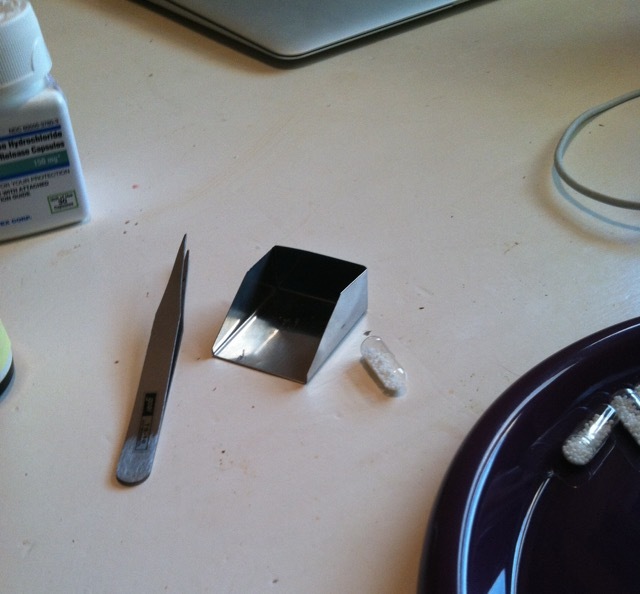 I'll weigh the pill content 3x and each time it's totally different (like .201mg vs. .190mg). I even calibrated it and the scale said it was fine. I've stopped using it and just took an average of how many beads I've left out over the last 13 days and am now just taking out that many beads each day. I know I'll have to measure once the dose gets small though, wish it was more accurate. One trick for getting more accurate readings is to keep the calibration weight in the pan while weighing our dose. Put the weight in the pan and press the "TARE" button. This will zero the scale but put the electronics in the middle of their range where they are the most accurate. Now weigh your dose as usual. I'm looking for recommendations, wondering if anyone knows some that are good. I'm willing to spend hundreds of dollars. The cheapo one that's popular is driving me crazy, I want to smash it on concrete. I think making my own solution is too much of a hassle, and liquid is too expensive, so I rather invest in a good scale cause I'm not getting off these pills anytime soon. Making own solution may seem daunting, but it's actually quite easy..
Reading this thread, I thought I'd add my situation since it involves the use of a digital scale and trying to ascertain as precise cuts as possible. Having some difficulty starting out on my taper the last couple days (sorry, haven't had time to update my sig line). I know most on his board are using liquid tapers of various kinds; I chose to stick with a dry cut microtaper since I am using a 0.0001g scale. Since it is still questionable in my mind as to whether my generic Clonazepam tablets are truly homogenous (the active med being evenly disbursed), I first started out by ascertaining an average of several tablets (since they vary in weight by 3-5%), pulverized the tablets, mixed the powder, weighed it (using a 0.0001g scale), encapsulating the powder, then reweighed, keeping the dose the same as my original dose, just to test my metabolism. I felt a bit funky after a few days of the capsules, stopped, and am now filing the tablet (much less time consuming and fussy), however, the concern is still whether the tablets are homogenous (you ask one pharmacist he says yes, since it's scored, no problem, you ask another, he says no guarantee, you ask the mfg, and even they cannot give me a straight answer). If not, then I would think working with tablets is a risky bet when it comes to w/d symptoms. And now, since my starting cuts are so tiny, they are sometimes either too much or not enough to get the tablet weight to the desired amount because of the weight variance per tablet. Any and all insight to assist me in determining what taper road is best would be greatly appreciated. I would rather iron out these measurement issues now than too far into the taper when w/d symptoms may be more of an issue. If you are pulverizing the tablets, I would not worry about the homogeneity of any individual tablet. They are all supposed to carry the same amount of the active ingredient. Unless you do chemical analysis tests of every part of a tablet, you'll have to work with that assumption. When you pulverize the tablet, you can mix the powder around so the active ingredient is also mixed throughout the powder. Many, many people have done this (as well as making a liquid) and tapered successfully. Finally, if you still distrust your measurements, you could get a good compounding pharmacy to do the work. For some drugs, they can work directly with the powder. Right, but I did not seem to react well to the capsules so I stopped. Then again, I only tried them for 4 days. Should I give them a longer shot? They are a ton more work to process, but, yes, they would eliminate the concern over homogeneity. Yes, give them more time. It takes at least 4 days for a dosage change to fully register. It could be you're losing some powder in the process. You may wish to make the change to DIY capsules when you want a dosage reduction. Also, be sure to weigh the powder for your dose outside of the capsule. Yep, made sure my powder weight was exactly the same weight as my original tablet weight average + re-weighed it and made adjustments once encapsulated. My concerns over the way I was feeling were more to do with the nuances of powder and capsule metabolism vs. the tablet to which I've been accustomed for the last 9 mos. Or do you think that's getting too "OCD? In other words, unlikely the change from tablets to capsules would've caused any reaction in the first couple days and more likely placebo? It seems to me you might have a habit of overthinking as well as perfectionism. I would not be a bit surprised if some anxiety was clouding your self-observations when utilizing your homemade capsules. Cannot disagree with that at all. Paranoia/OCD about this "horrible" med from day one, procrastination knowing yesterday is the time to actually take action + having way too much time to develop a good case of cyberchondria , reading all the horror stories from that of Stevie Nicks to the forums (the only ones that seem to post) to the recent research showing benzos in general contributing to Alzheimer's, blah-blah-blah. Nonetheless, In my 9 mos. on K, I cannot say it has been altogether unpleasant physically, moreso, the daily mental anguish over the thought of poisoning myself, having to hold until I tapered my other psych med (and I realize I'm a small fish here compared to the multi-decade poly-drugged veterans). More than once, and over time, I find myself needing to be put in check. Thanks. Again. If you reweigh the capsules after you fill then and make adjustments, then you are throwing the dose weight off by the variance in the capsule weights. The weight of the capsule makes no difference in the overall scheme of things. Are you actually using a microgram scale (.0001g)? Trying to manipulate that small an amount of powder without true lab equipment is fruitless. If you really need to make your doses that accurate then it would be best to either buy or make your own liquid. Any change in dose, be it brand name to generic, tablet to liquid, tablet to powder etc. runs the risk of some symptoms being caused by the change. Also any dose change takes a minimum of 4 days to become steady state in the blood, after which you need to let any resulting symptoms settle out before you can tell if there are any problems. The first sign being that the symptoms don't settle out given enough time. And by time we need to think in terms of geologic not glacial. Don't discount the placebo effect, it's very powerful, especially when dealing with these sorts of drugs and WD. No, am adding/factoring the weight separately of the capsule & not altering the powder weight. And yes, am using semi-micro scale (it is actually a .00001g scale which was far too sensitive for my non-lab environment, so I had to re-program it to 4 decimals - lots of trial and error) to get a stable reading. I actually have it set to read in mg (0.0mg) instead of g now which is nice. I may convert to a liquid taper on down the road as my dosage become much less and where accuracy becomes even more an issue. I have learned from tapering my prior psych med, Lamictal, that the 4-day "rule" is valid and has been documented in my log during my taper of it. My taper "training" on L taught me the basics of tapering and was never w/d-free. I had many times following cuts that I would become noticeably symptomatic, but after a few days of holding or updosing, would acclimate rather nicely, and, after what some folks who've been on that med have reported, it's no cake walk either. The placebo has been in effect even BEFORE I began my taper! I'd like to ask the same question. I don't like the Gemini 20 scale and I've even used the tips suggested. Can't seem to find a more expensive one with decent reviews for measuring tiny amounts, however. I found it to be is the most economical way to go to get a mg measurement because it is a dual range semi-micro balance (the full micro balances are far too expensive and a moot point point unless used under strict lab conditions). Pricing varies depending on the distributor ($1200-$1500). Unless you're using it in a lab, you won't ever get stable readings at the full 5 digits (0.00000g) as it is highly sensitive to temperature, humidity, light, etc. and will have to adjust it to 4 digits (0.0000g) or 0.0mg which is where it's working fine now and is more than enough for microtapering. It took me an entire month to troubleshoot this before I started my taper. I couldn't find this topic anywhere so I am going to ask my question here. Is it okay to save the extra powder from a capsule after weighing out your dose? Yes, save it in a clean, dry container with a tight-fitting cap. A colored container from the pharmacy, often green or amber, will help protect it from the light, which is important. Keep it in a cool, dark place, as many drugs can be degraded by light or heat. I've got a question about digital scales. I use the Myweigh Gempro-250 digital scale for more than 3 years now and am very happy with its performance (fast, accurate weighing. If i weigh the same thing 5 times, it's 5 times the same weight. On the previous scale i used, this was not the case...). The 'problem' i now encouter however, is that below 15mg, the scale takes a lot af time to weigh... If i weigh something that is 14mg, then the scale starts at 11mg, after 5-10 seconds 12mg, another 5-10 seconds later 13mg and another 5-10 seconds later 14mg... I find this very annoying and time consuming... (especially cause i weigh all my pills 3 time, just to make sure the weight is accurate...). I wonder how other scales perform at these low weights? I wonder if it would read faster or slower if you change it to the division you aren't using? The electronics involved in the scales is very sensitive and finicky. They tend to be the most accurate in the middle of their work range. One trick is to put the calibration weight into the pan and then "tare" it out before making your measurements. This will put the scale into the middle of its range and make it easier to work with. The bottom line: Milligram strain gauge digital scales were developed to meet a price point but they do sacrifice accuracy at weights <15mg compared to a magnetic force restoration balance. The increase in expense is considerable, so it's a question of whether the added accuracy is worth the expense, not to mention, a personal financial decision. I look at anything to do with my health as an investment, so cost (up to a certain point I feel comfortable), is not an issue. My decision was to go with a lab quality scale which uses force restoration and measure in the 0.0000g range as I posted upthread. Many people have used the Gemini scale to taper. It is not as accurate as a more expensive laboratory scale, that is true. Wanted to share some tips on using the Gemini scale. ​This has made it a more reliable scale for me. Hope that helps! Pulverizing or dissolving Effexor XR beads will remove the time-release coating. Then you have immediate-release Effexor. that was a very insightful video, thanks for posting. I have a question about pulverising - what should i use? I have a mortar and pestle but am worried that some with get stuck on the pestle and i will miss it - the beads are so small anyway...do i grind it and then pour the water into the mortar and leave it there to ensure i get it all? Beads shouldn't be pulverized. Just weigh the beads and remove as necessary until you get the weight you want. I don't even pulverize my tablets, I don't see the point and, as you mentioned, the powder that is left behind could affect the dosage. i was considering making a solution to help make accurate dosing more reliable - i have found that my gemini scale is not accurate despite putting the weight on the scale as described above. When my scale is acting up I calibrate over and over until it improves. If it's still off I change the batteries, using lithium batteries that are specially made for digital devices. If it's still acting up and the reading are significantly off then I just get a new scale. 25 bucks is nothing when it comes to something as important as tapering safely. When it comes to Effexor I've heard of people counting beads instead of weighing, however I know the beads are not uniform in size so that could interfere with getting an accurate dosage. If I were you, I'd experiment with beads that are not pulverized. Offhand, that seems like an unnecessary step to me. Although Sartorius is the Rolls Royce of balances and has an excellent reputation, I was able to find a dual-action balance that measures in the sub-milligram range (.0001g) for about the same amount of expense (see my posts upthread for details). This would give you an even more accurate weighing during a taper, but it all depends on your needs and the type of med(s) you are tapering. Hope this helps. Hi csm2014 Hi. Could you please kindly tell me the exact name of the scale you are using? I'm having trouble finding your thread. I'm not very great with this technology apologies! If it's working for you id like to buy the exact one and give it a try. Thank you so much. Much appreciated! If you get it, let me know how it works for you.